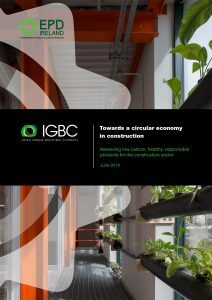 The ASBP has helped to develop a new guide in collaboration with the Irish Green Building Council which seeks to inform industry about lower carbon, healthier, more resource-efficient products in order to enable a circular economy in construction. ASBP Director Simon Corbey contributed significantly to the guide, working alongside Pat Barry, CEO of the IGBC. Simon provided guidance on the health impacts of products, in particular regarding indoor air quality, VOCs (volatile organic compounds) and material toxicity. He also gave an update on the latest developments with ecolabels such as natureplus and their new product database which can be found on the procurement tool Baubook. Life Cycle Assessment (LCA) aficionado Jane Anderson (Consulting Expert, Thinkstep and ASBP Board member) gave her expertise to the sections on Environmental Product Declarations (EPDs) and LCA. Our new Technical Associate Katherine Adams (PHD researcher, Loughborough University and Principal Consultant, BRE) gives an overview of the circular economy in construction and outlined the importance of designing more resource efficient products and buildings which are flexible, adaptable and can be deconstructed and reused. The guide also received input from Jannik Giesekam (University of Leeds) and David Cheshire (AECOM) and features a number of case studies including projects from Google, Cundall and RKD Architects.